Online courses are available anywhere there is an internet connection. Live courses are available only in San Diego County. In addition to the guard card courses, Practical Defense Systems offers a full range of security officer training. Once you have completed your guard card training course and passed the written test, you must get your fingerprints taken at a LiveScan location. The LiveScan operator will also collect the fees required to pay for your FBI and DOJ background checks. 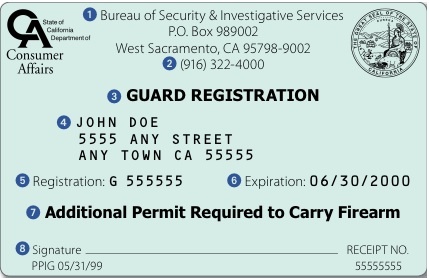 At that point, you may submit your application for a guard card to the California Department of Consumer Affairs, Bureau of Security and Investigative Services (BSIS). You can apply for your guard card, either on-line at the Bureau’s website at http://www.bsis.ca.gov/, or by postal mail. 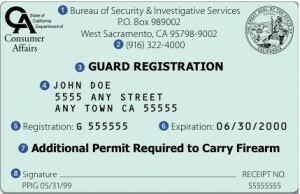 32hr BSIS guard card course – $84.95 Complete your continuing eduction in one easy course. 40hr guard card package – $95.00 Get all 40 hours of required training done up front. Practical Defense Systems is licensed by the state of California as a BSIS training facility (lic #s TFF1296 and TFB1197). We offer online security officer training throughout the state of California with live security officer training available in San Diego County. We are located at 8880 Rio San Diego Drive – 8th Floor, San Diego California 92108. For more information, please contact us toll free at 888-233-6488 or refer to the detailed information available on our website.